Take a residential neighborhood, build a linear pedestrian park spanning several city blocks, add spectacular views across a nearby body of water, shake and stir. The recipe for overdevelopment, gentrification and armies of tourists, walking five abreast and shooting selfies, no doubt! 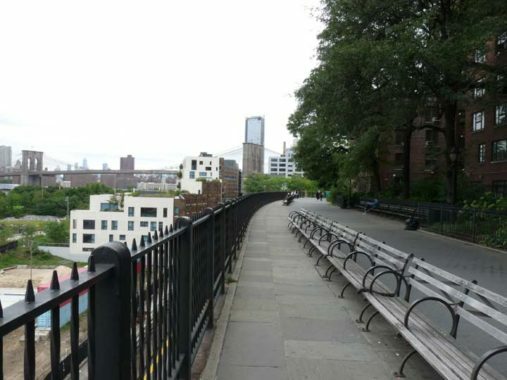 No, I’m not talking about the High Line in the Meatpacking and Chelsea … I mean the Brooklyn Heights Promenade, which opened in stages in 1950 and 1951 way back in the Truman Administration, where hordes of shuffling out-of-towners have yet to appear. 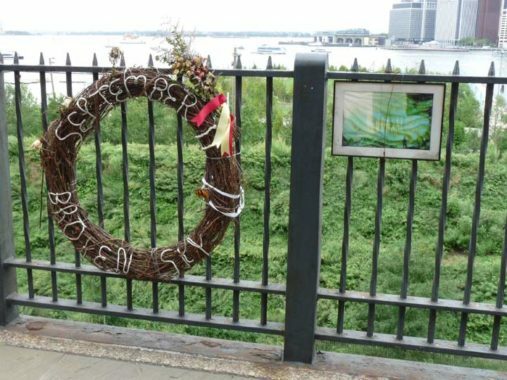 From the 1940s through the 1960s, 20th Century NYC traffic czar Robert Moses was busy connecting the Brooklyn-Queens Expressway chain between the Kosciuzsko Bridge and the Verrazzano-Narrows Bridge (the last jewel in his crown). The BQE runs on various elevated and trench sections, but the section in Brooklyn Heights, first proposed in 1941, proved problematic as area residents understandably were up in arms over a plan that would have cut the heart out of the close-knit neighborhood with its brownstones and woodframe dwellings. 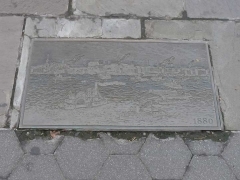 Moses accepted a neighborhood group’s innovative idea to place the BQE on two separate three-lane decks along Furman Street on the bluff below the Heights, an area that faced the waterfront and for most of the 20th Century, was the staging area for shipping goods on barges across the harbor. A local railroad connected the various storehouses, or “stores” facing the water on Furman, and trucks then carried goods all over the region. Excerpt from a Belcher-Hyde 1929 map of Brooklyn Heights. Beginning in 1945, all the buildings on the west (top) side of Columbia Heights east of Orange Street, and all the buildings on the south (bottom) side of Furman Street were razed to make way for the Brooklyn-Queens Expressway. West of Orange Street, the BQE was placed on its triple deck. I’ll get to Brooklyn Bridge Park a bit later, but the “Stores” on the west side of Furman Street were mostly gone by the time I began frequenting the area in the 1970s, with one exception: that National Cold Storage building was a hardy survivor all the way to the mid-2000s. The area was a barren wasteland for the most part by the time the park began construction around the same time. 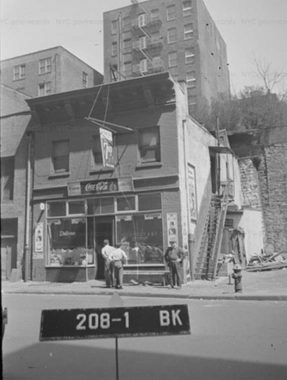 Here’s a 1940 photo of #67 Furman Street, a grocery store. Buildings along Columbia Heights loom up behind a stone wall. 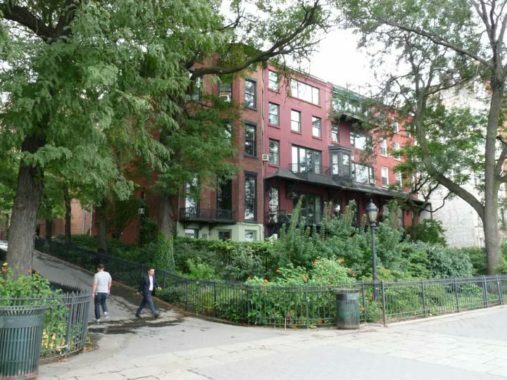 The grade between Columbia Heights and Furman Street is so steep that only two modern streets traverse it: Joralemon Street and (Old) Fulton, which uses a winding course to get down there. Formerly, Montague Street made the trip with a ramp crossed by the picturesque Penny Bridge. Ramp, bridge and all were decimated when the bulldozers and the BQE arrived in the late 1940s. You can take a look at all the former Furman Street buildings, except most of the warehouses, on this Municipal Archives page. 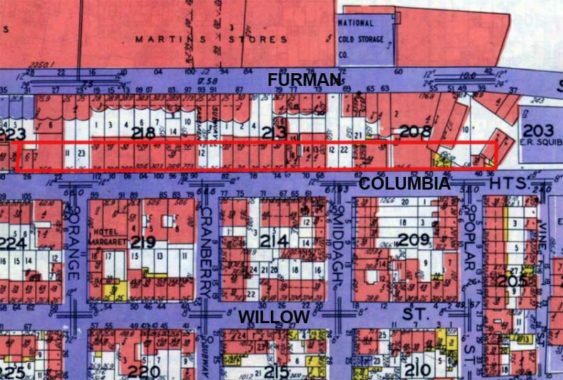 Bear in mind, though, a lot of Columbia Heights buildings are mislabeled Furman there. 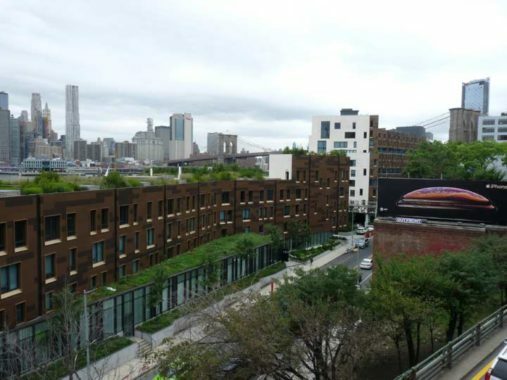 But what to do with the roof of the double-decked BQE? 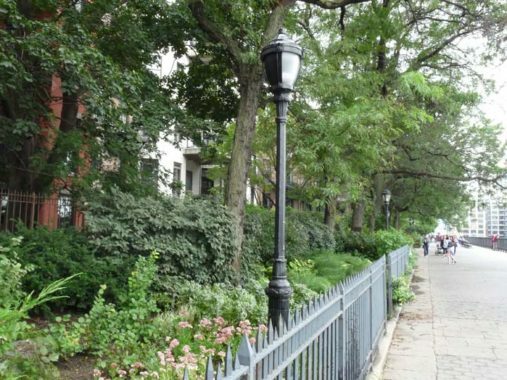 Neighborhood groups proposed a lengthy, linear park facing the harbor running between Remsen and Orange Streets, running above Furman Street west of Columbia Heights. Moses acceded, providing it was a public area open to all. What is officially called the Esplanade, but called the Promenade, opened from 1950-1951, with the BQE opening to traffic in 1954. And thus, the situation has been, until the late 2010s. More on that a bit later. 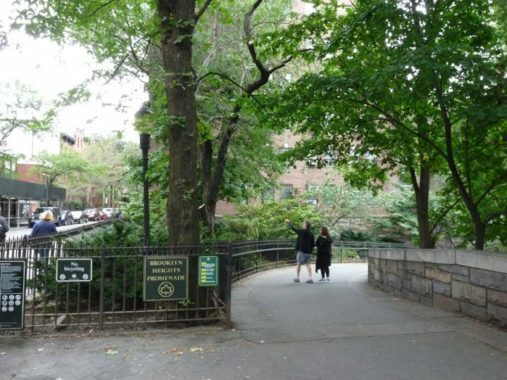 Approaching the Promenade from Willow and Cranberry Streets in Brooklyn Heights. Much of the area was laid out in the mid-19th Century by the Hicks brothers, who assigned their favorite plant names to some of the streets: Willow, Orange, Pineapple, Cranberry — a nice fruit salad. The Manhattan skyscrapers seen in this view are One Financial Square and 111 Wall Street. Ever-changing Manhattan skyline from Cranberry Street and Columbia Heights. Here, the BQE curves underneath Columbia Heights, and two relatively new parks are on either side: Squibb Park, named for pharmaceuticals manufacturer E.R. 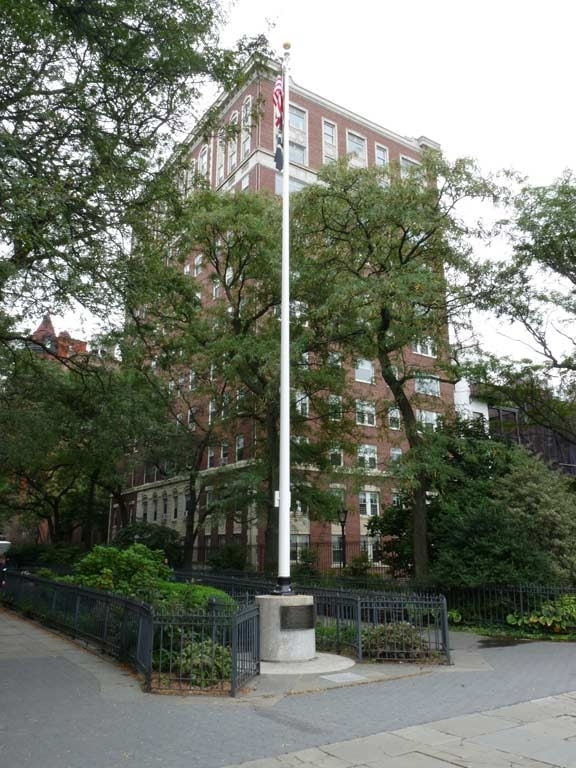 Squibb, who built a massive factory in Brooklyn Heights that was for many years the home of the religious organization Jehovah’s Witnesses; and Harry Chapin Playground, named for the pop songwriter (1942-1981) “Taxi,” “Cat’s In The Cradle”) who spent his boyhood in Brooklyn Heights. Chapin lost his life in a car crash on the Long Island Expressway en route to a concert. The Squibb Bridge goes over the BQE and connects Squibb and Brooklyn Bridge Parks. 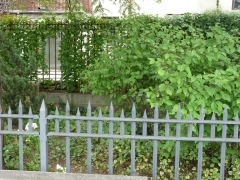 After its opening in 2012 it was found to be unstable. Repeated repair jobs have proven fruitless and it will now be torn down and replaced. 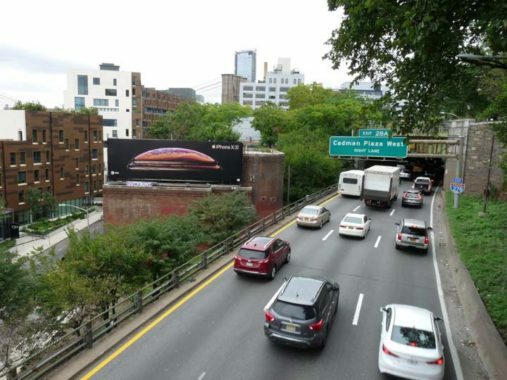 Here’s a good look at the double-decked BQE from Columbia Heights and Cranberry Street. After over 60 years of wear and tear, the BQE is in seriously bad shape with some parts of the roadway worn down to the metal superstructure. Water damage, salt and rust have taken their toll. 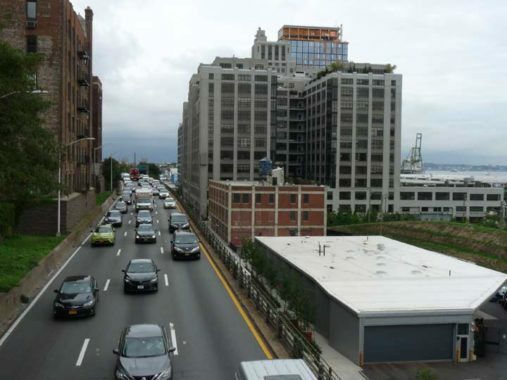 The Department of Transportation has no choice: they want to replace the BQE. 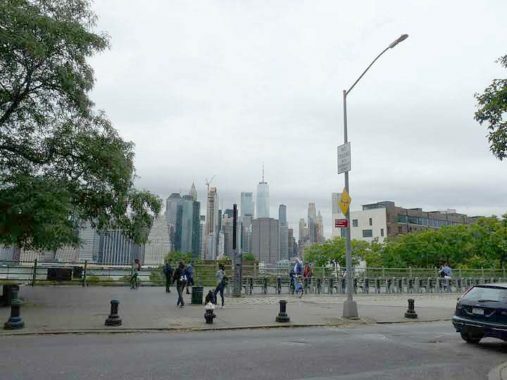 There are two solutions on the table, one in which the decks will be taken out of service and replaced, with a temporary BQE running in place of the Brooklyn Promenade over Furman Street (6 years) and another plan that would replace the BQE one deck at a time, with no Promenade displacement (8 years). 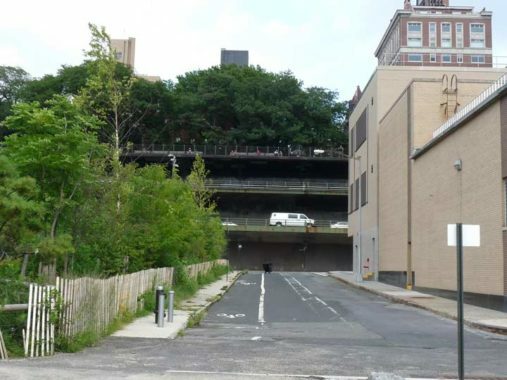 Another, less-likely, proposal from the Wall Street Journal, echoed in Streetsblog, calls for the abandonment of the double decks and a boulevard-style roadway (presumably a widening of Furman Street). North end of the Promenade accessed from a ramp at Columbia Heights and Orange Street. The new luxury condo development 90-130 Furman Street was built about 5 years ago on the west side of Furman, replacing the old cold storage building and in the no man’s land left over from after the “stores” were torn down. 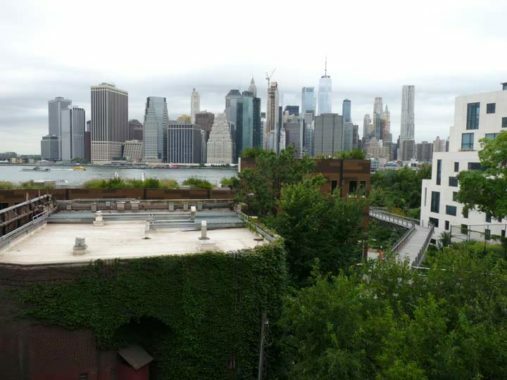 The back end of the development faces the Manhattan skyline, with views of the Brooklyn Bridge. 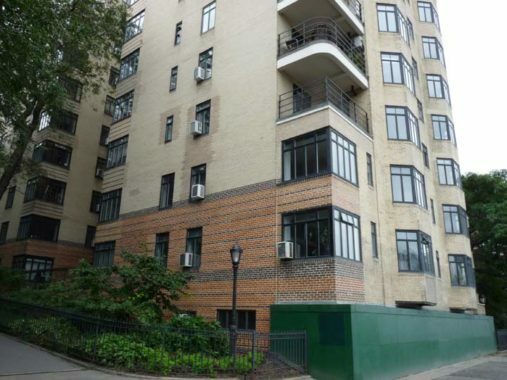 All well and fine for the residents, but the condos block the Manhattan view from Squibb Park. The BQE looking north from Orange Street. 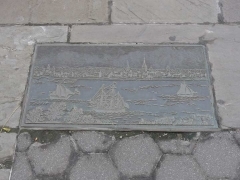 Unmarked globe with astrological symbols at the north end of the Promenade at Orange Street. If anyone knows who the sculptor is, let me know in Comments. 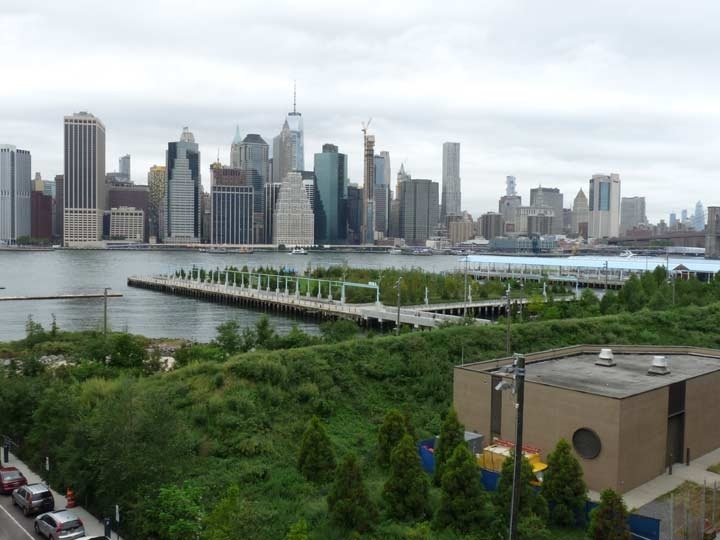 Brooklyn Bridge Park is an over $200 million extravaganza, an 85-acre park along the East River from Atlantic Avenue north and northwest along the East River to Jay Street in DUMBO. 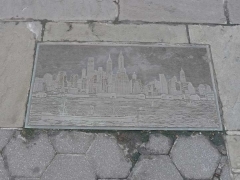 It was formerly docklands worked by the Port Authority of NYC, which ended operations north of Atlantic Avenue in 1984. It was a bustling, robust operation that used floatbridges as well as a local railroad to bring supplies and goods from the world to Brooklyn, a job that has largely been supplanted by the container port in Newark. 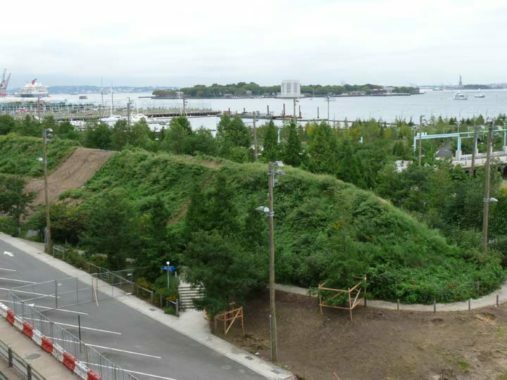 That left the 85 acres largely abandoned, and until recently in NYC, former waterside industrial land tended to stay abandoned. 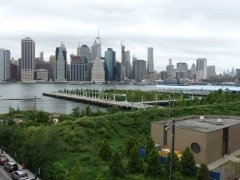 In 2002, funding began to be acquired (ultimately, high rise apartment buildings will need to be built nearby to keep the revenue stream going; just one, 1 Brooklyn Bridge Park, has been completed). 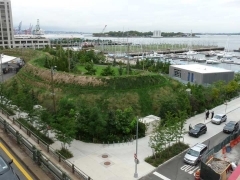 Actual construction began in 2009 and will be done in various phases, as the park has been divided into six sections, or “piers” between Atlantic Avenue and Old Fulton Street. The northernmost and southernmost, Piers 1 and 6, opened to the public in 2010 while construction continues on them, while the interior sections at Piers 3, 4 and 5, were largely finished by late 2013. 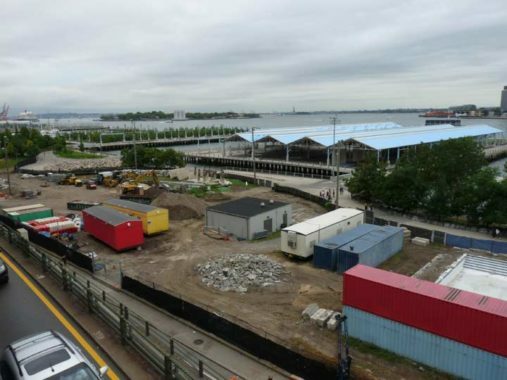 Only one section, Pier 2, is unfinished and Parks expects it to open by 2020. 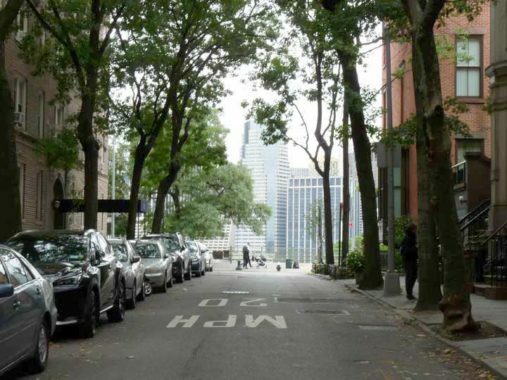 In 2008, I walked the length of Furman Street before the park was under construction. The Promenade, looking south from Orange Street, is much more spectacular in bright weather, but it was dull in NYC almost every day between September and November, so I had no choice but to do the shoot on a cloudy day. Here you can see the general Promenade formula. A view of the harbor and skyline on the west side, and the back yards of houses on Columbia Heights on the east side. Looking north on the Promenade toward the Lower East Side skyscraper One Manhattan Square, which partially ruins the Brooklyn Bridge view from here, and partially ruins the Manhattan Bridge view from DUMBO. Here’s the back end of 150 Columbia Heights, alongside the Clark Street promenade entrance. 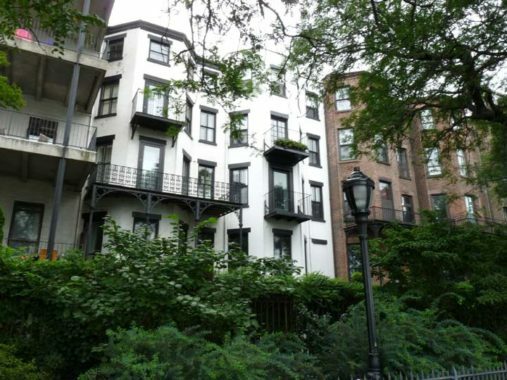 Brooklyn Heights was NYC’s first neighborhood whose homes were protected from demolition by the Landmarks Preservation Commission, in November 1965. 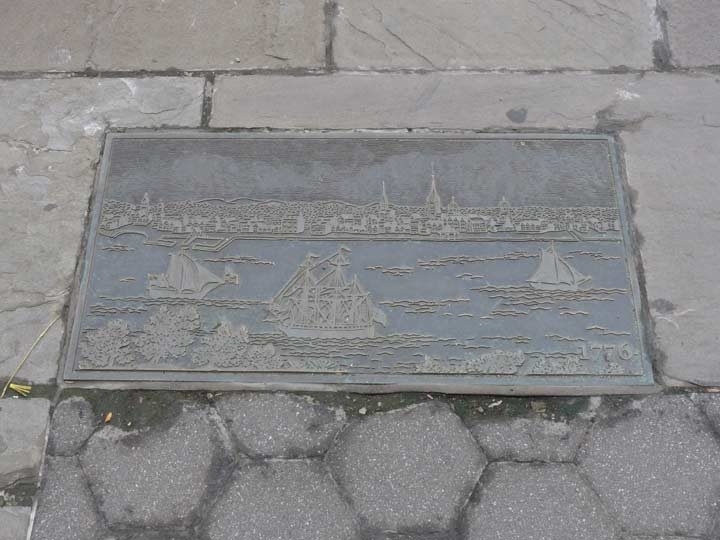 Four historical plaques set in the pavement of the Promenade at Clark Street showing the Manhattan waterfront through time, from 1776 to 2001, just before the twin World Trade Center towers were destroyed by terrorists. At Pier 3, Brooklyn Bridge Park features a man-made, 30-foot tall mound planted with trees and grass, known as a berm, meant to be a noise deflector: parkgoers are partially shielded from the honking and noise of the BQE by the mound. 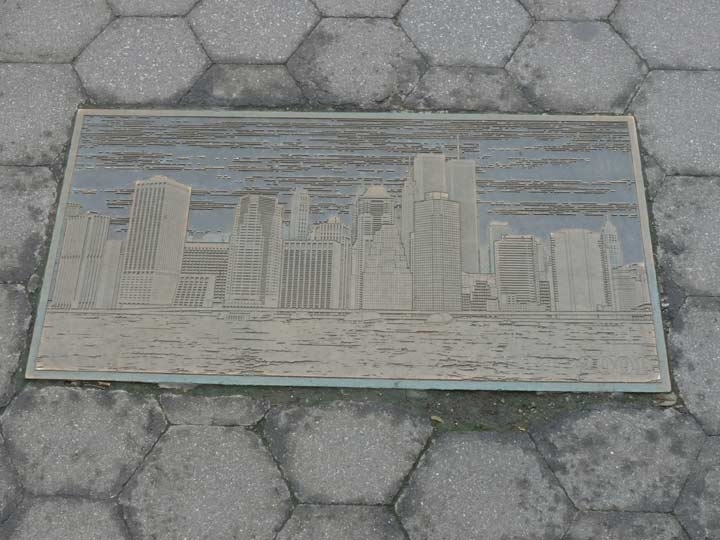 A few years ago, I was at Brooklyn Bridge Park and the stub of Montague Street that issues from Furman Street. Here you can see the double-decked BQE, with the Promenade the cherry on top. Formerly, Montague Street was ramped down to Furman Street from the Heights to a ferry, and was spanned by an iron bridge, constructed in 1859, known as Penny Bridge. Ramp and bridge were demolished to make way for the BQE. A small bit of the ramp can be seen on this image from 1940. The street was named for Lady Mary Wortley Montagu (1689-1762), a socialite, poet and prolific letter writer who campaigned for the then-new smallpox inoculation; she herself had been stricken by the disease. Her father was the Duke of Kingston, Evelyn Pierrepont; the family is remembered by a street just north of Montague. 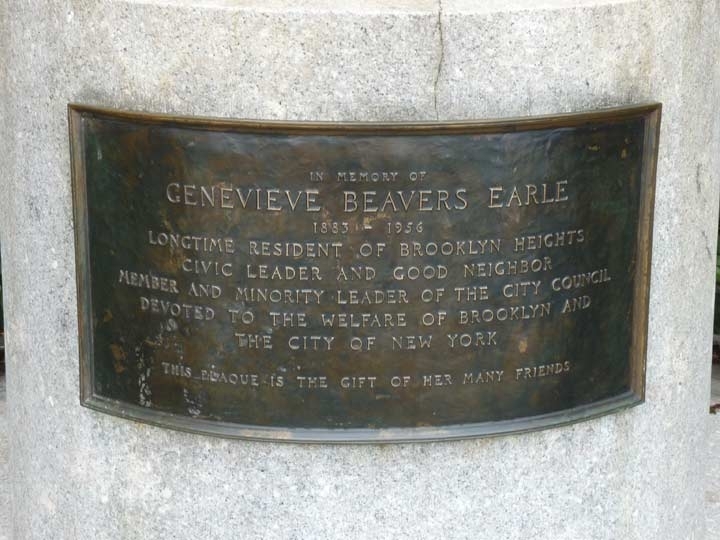 The street was the first site of the Brooklyn Academy of Music, as well as Brooklyn’s first public and business libraries. 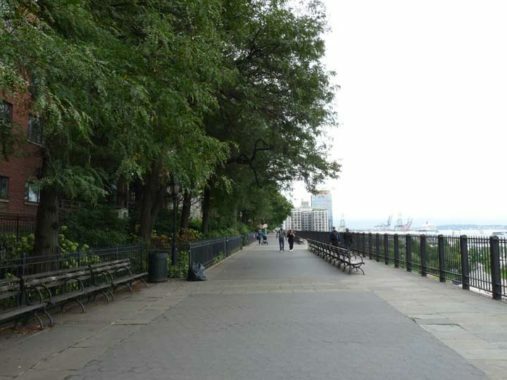 Much of the Brooklyn Promenade looks essentially the way it did in 1950. 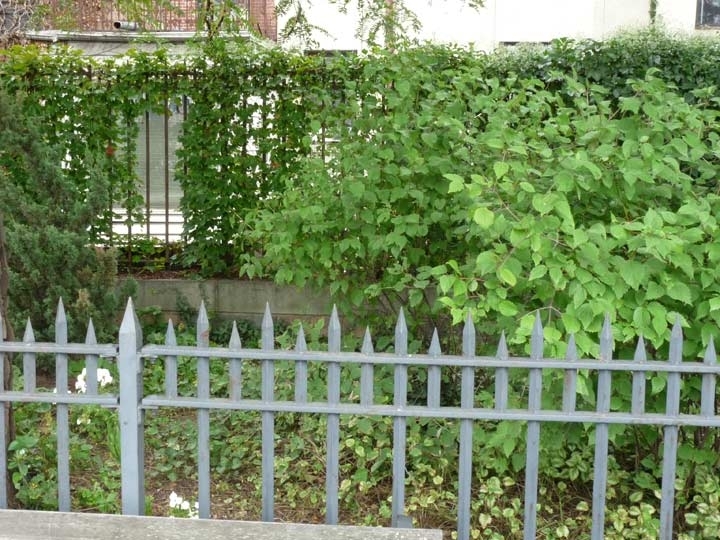 The back yards and rears of Columbia Heights mini-mansions, and the identical iron railing. 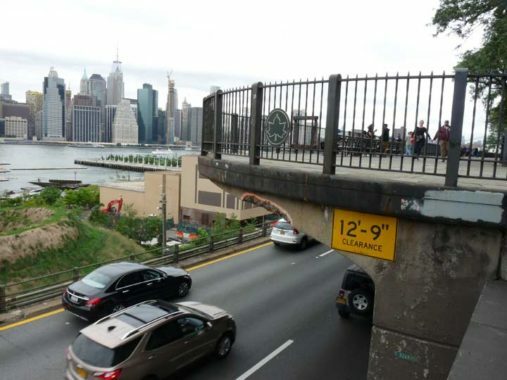 This is likely going to change sooner than later, if a temporary BQE has to be placed here. Type B park posts illuminate the Promenade. The owners of the adjoining building probably asked the DOT to black out the back side of the light to reduce glare. The back yard of #196 Columbia Heights. This flagpole at the Montague Street Promenade entrance was placed in honor of Borough Park-born, Brooklyn Heights resident Genevieve Beavers Earle (1883-1956), the first woman elected to the New York City Council (1937). Looking north and south along Brooklyn Bridge Park. Its new amenities include recreational piers and a marina. Note the second noise-baffling berm. A look south from Remsen Street at the BQE and One Brooklyn Bridge Park, the first residential building opened adjacent to the new park. Built as a warehouse in 1928, it was converted to luxury residential in 2008. 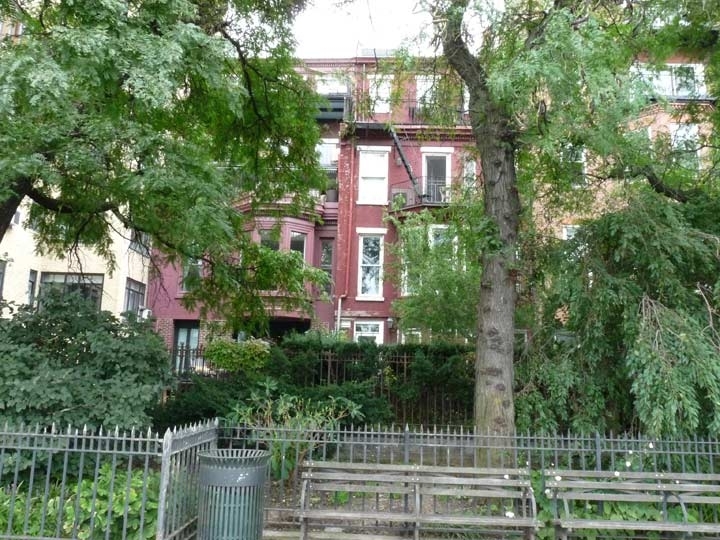 In 1977, Number 8 Montague Terrace, which faces the East River, doubled as the gateway to Hell in the horror flick The Sentinel, which featured Burgess Meredith, Ava Gardner, Sylvia Miles, Christopher Walken and John Carradine. The Promenade’s deteriorating condition is evident in this photo of its south end at Remsen Street. 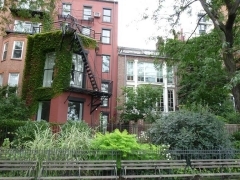 I went to St. Francis College on Remsen Street between 1975 and 1980 (obtaining a BS in Sociology, which I never used; I gravitated toward print). 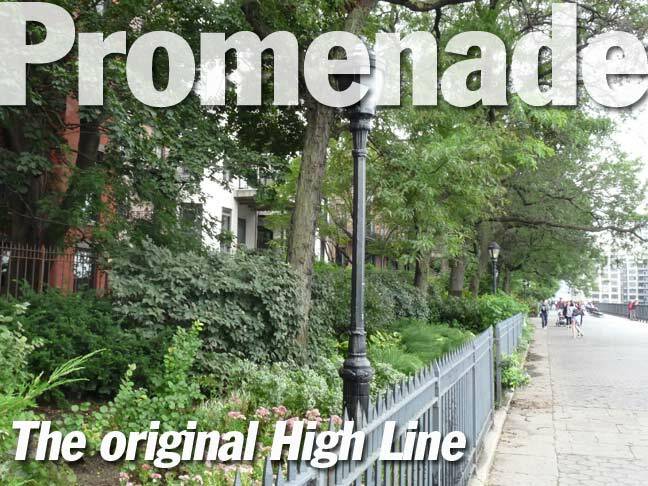 I touched on the Promenade in a post I did about the immediate neighborhood a few years ago. 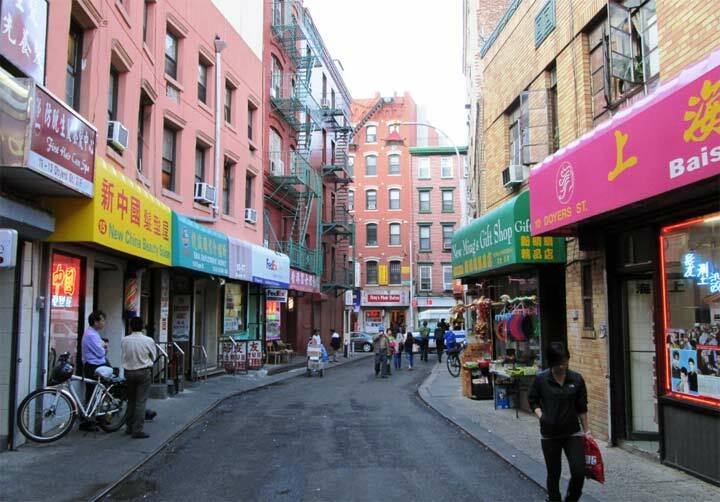 During those years, I didn’t go exploring in the neighborhood to the degree I would in later years (I roved all over Manhattan during my lunch hours at Macy’s in the early 2000s). But, subconscious seeds must have been planted. I visited the Promenade a couple of times during those years. 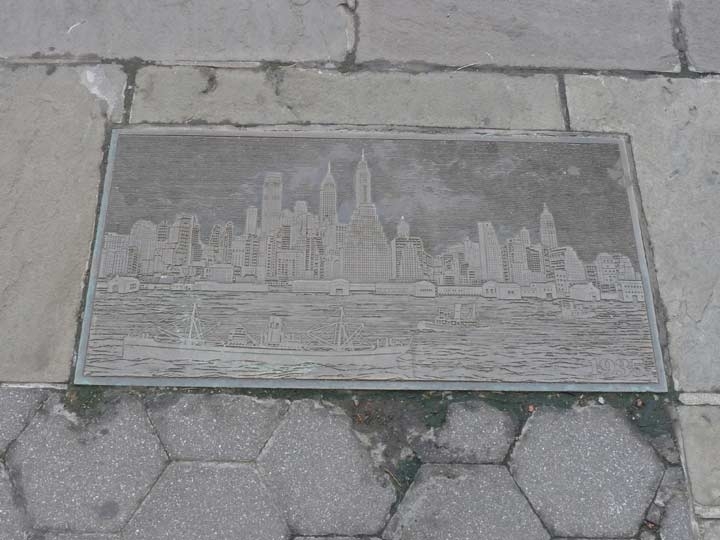 The view was vastly different, not only of the Manhattan skyline but of the Brooklyn waterfront, where the last vestiges of commerce were slowly winding down. The Promenade does get jammed now and then, especially when the July 4th fireworks are shot from the East River. I was among the hordes clustered on the Promenade for the Brooklyn Bridge centennial in 1983. By and large, though, it hasn’t hosted the tourist hordes the High Line has, and Landmarks protection works against clusters of glassy skyscrapers crowding in, as happened in Chelsea and the railroad yards west of Penn Station. The Eternal Montrose Morris has the full scoop with the Promenade and its history at Brownstoner. I worked in Brooklyn Hts briefly after 9/11. 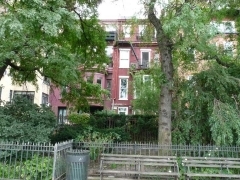 Yes, rats all.over Montague Terrace, Remsen Street not changeed same rats. Anyone else singing the Patty Duke show theme song while on this page? 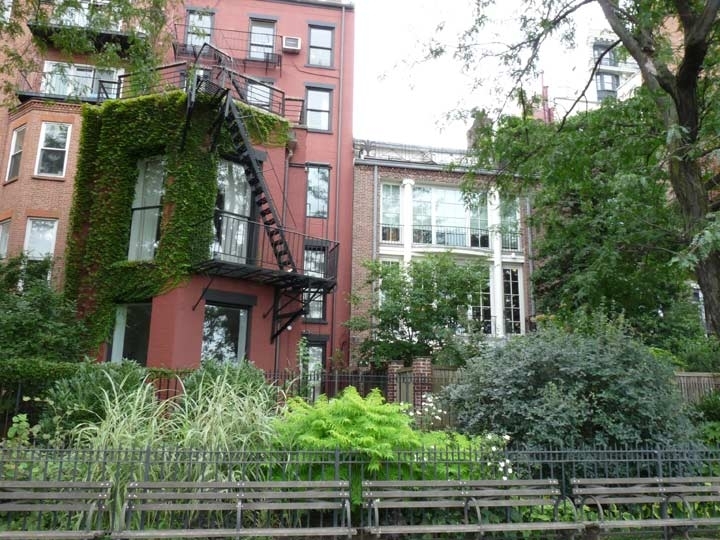 In the early 90s I was visiting my friend who lived in Cobble Hill. We went walking and found ourselves on Joralemon going down to the water. I saw a street sign and ignorantly pronounced its name out loud. Without missing a beat my friend cut a joke, aping my mispronunciation, saying “it sounds like a Puerto Rican guy talking to his car: ‘Jour a lemon. '” It was the snappiest reply I ever heard. 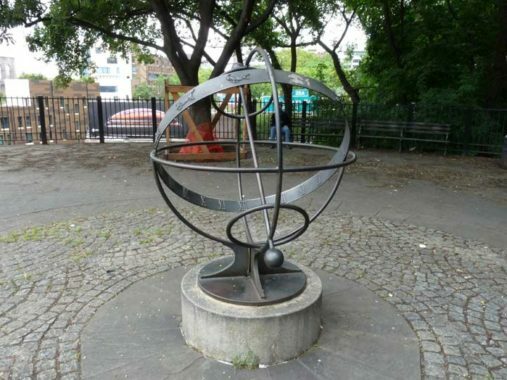 The “unmarked globe” is a sundial. The shadow of the central bar falls across the roman numerals to indicate the time. I remember seeing the Sentinel as a teenager . Scarred the hell out of me . Cool seeing the house still there – for now. As far as I know, that section of the bqe is the only triple cantilever road construction in the US. Would be curious if anyone has any other examples. 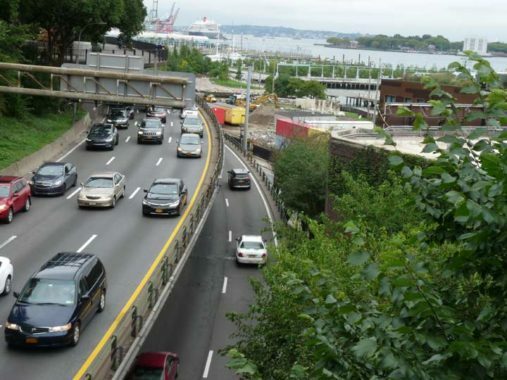 Unfortunately, the BQE in that area needs to be fixed whether anyone is for it or not especially since it’s highly used by commercial vehicles on a regularly basis, and they will have to go somewhere when it’s getting fixed. 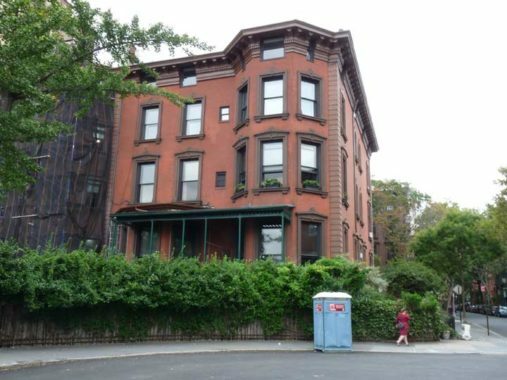 The Sentinel house is 10 Montage Terrace and NOT 8 Montague Terrace. 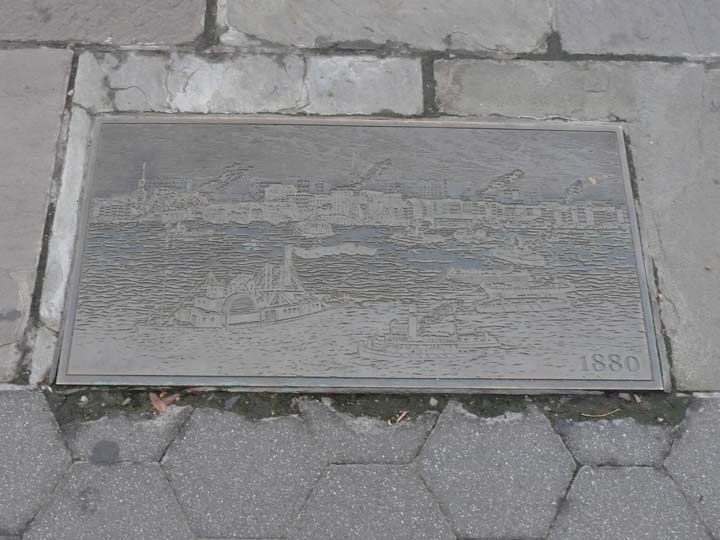 this is a GREAT aritcal thank you so much for this valuable history of our promenade. 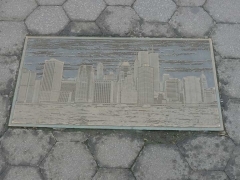 Video of Promenade with Henrik Krogius. Great article. Thank you. A minor correction: Columbia Heights itself (plus the small portion of it called Everit Street) also spans the entire grade of the bluff, though I concede it ends at Fulton Street rather than Furman. Very popular for that reason with skateboarders looking for a thrill and joggers looking to indulge their masochism.